For the month of October, the U.S. Food and Drug Administration (FDA) reports that 4 out of the 96 (4.2%) total seafood entry line refusals were of shrimp for reasons related to banned antibiotics. 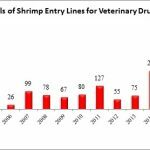 The FDA additionally updated its reporting for the month of September to now include an additional refusal of a shrimp entry line for reasons related to banned antibiotics. Khulna Frozen Foods Export (Bangladesh), a company that was added to Import Alert 16-124 (“Detention Without Physical Examination of Aquaculture Seafood Products Due to Unapproved Drugs”) on October 23, 2018, had one entry line refused for shrimp contaminated with veterinary drug residues by the Division of West Coast Imports on September 27, 2018. In addition to these shipments, the Division of Northeast Imports refused an entry line of shrimp shipped by Thuan Phuoc Seafoods and Trading Corporation for unsafe additives and for being poisonous on October 11, 2018. Thuan Phouc Seafoods and Trading Corporation was added to Import Alert 16-127 (“Detention Without Physical Examination of Crustaceans Due to Chloramphenicol”) on August 14, 2018 for chloramphenicol in its shrimp shipments. 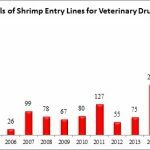 The FDA also refused two entry lines of shrimp from two different Indonesian companies in October due to the presence of salmonella.